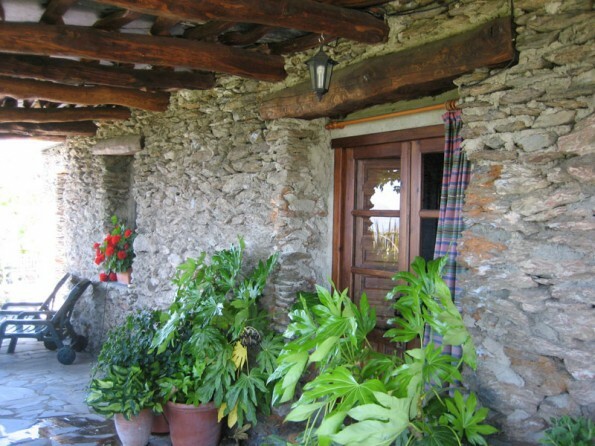 In the heart of the rugged and unspoilt Alpujarras region you will find Cortijo Opazo, a traditional but beautifully renovated farmhouse offering two charming private apartments and a glorious garden. This is a wonderfully tranquil place. 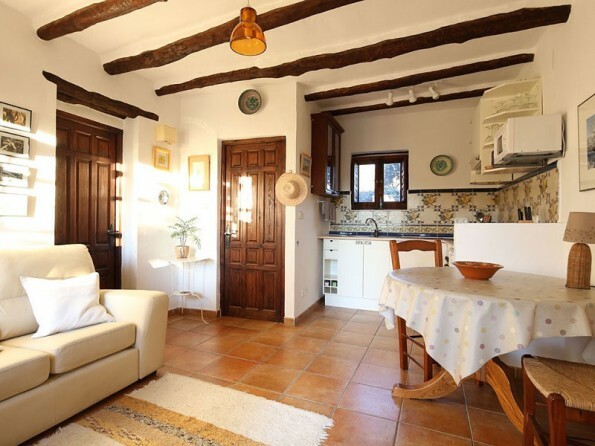 The farmhouse is divided into two delightful apartments – La Corona, which is spacious with gorgeous valley views, and El Lujar, which is cosy and romantic. 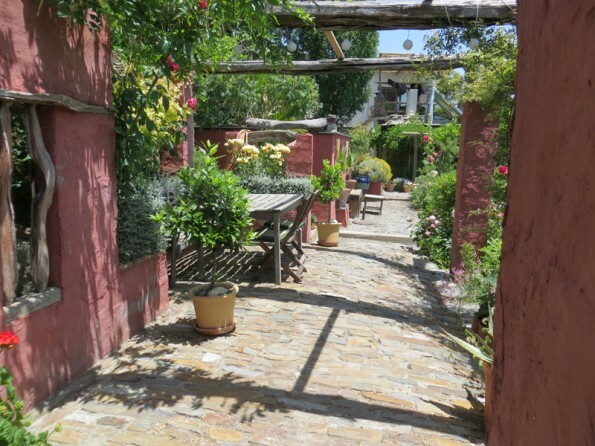 And although the apartments are lovely, the feature which makes Cortijo Opazo most special and unique is the garden, a terraced oasis of flowers, wildlife and quiet corners. 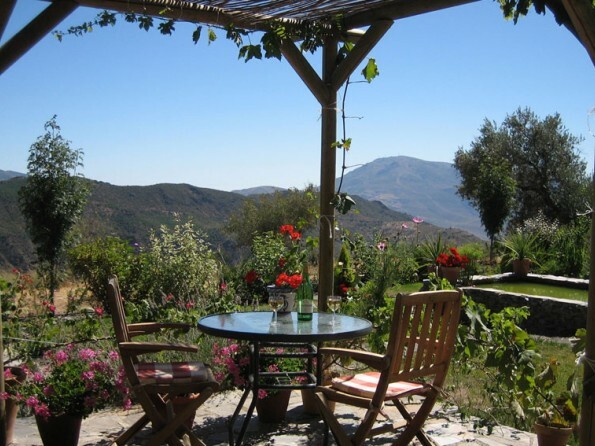 The Alpujarras is a hidden yet magical corner of Andalucia that is waiting to be discovered and the Cortijo is an idyllic setting in which to unwind. The Alpujarras is a hidden corner of Andalucia, located underneath the mighty Sierra Nevada Mountains and between the enchanting city of Granada and the gorgeous Mediterranean coast. It’s an ideal area for walking, whether you’re tackling high level snow line walks or enjoying casual meanderings round the valley, and there’s lots of Moorish history and Berber architecture to discover. The distinctive little mountain villages are a true cultural treasure, you can go open air swimming in one of the many waterfalls and natural pools, there are several horse riding stables in the area, or you can go cycling, canyoning, white water rafting or even skiing. Nature enthusiasts will love the wild flowers, birds and butterflies, this is a popular destination for painters and photographers, and the famous Alhambra is just over an hour away. There’s something for everyone in this special unspoilt part of the world. The nearest train station is in Granada, but Malaga would also be a viable option. Malaga airport is about 2 hours by car, Almeria is about 2.5 hours and Granada is just 90 minutes. The easiest way to get from the airport is by hiring a car and the site can be found between Pitres and Pórtugos, amongst a collection of villages called 'La Taha'. The house is situated on a steep hill leading down from the village of Portugos to the village of Atalbeitar. Motril - boats to Melilla on the north coast of Africa. 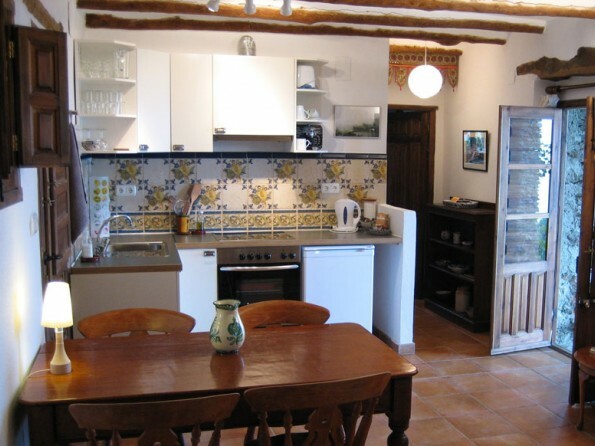 La Corona is the larger of the two apartments, with one double bedroom, a well-equipped ceramic tiled kitchen and an open plan living area with a sofa, a dining table and chairs, a bookcase and a wood burning stove. The bathroom has a walk-in wet room style shower and the bedroom is light and airy, with views out onto the surrounding countryside. 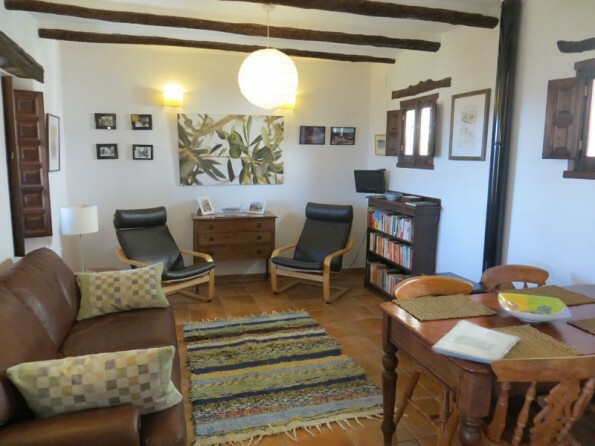 El Lujar has one double bedroom that looks over the surrounding hillside as well as a clean modern kitchen and an open plan living area with the same furnishings as La Corona. 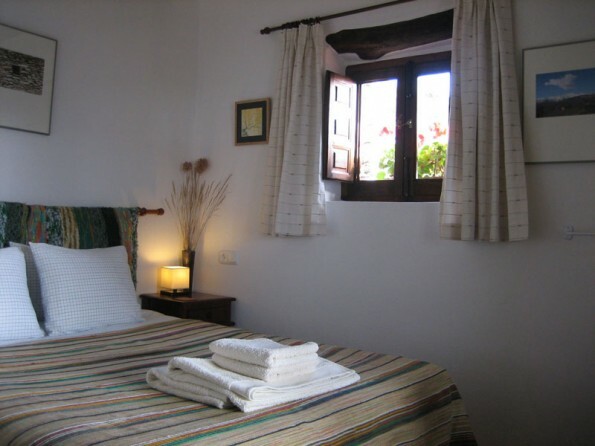 There is an extra en-suite guest room which can be booked in conjunction with El Lujar. La Corona is situated at the front of Cortijo Opazo and has a glorious covered south-facing veranda with dining furniture, sun loungers and exceptional views over the valley. This private area leads to the communal garden. 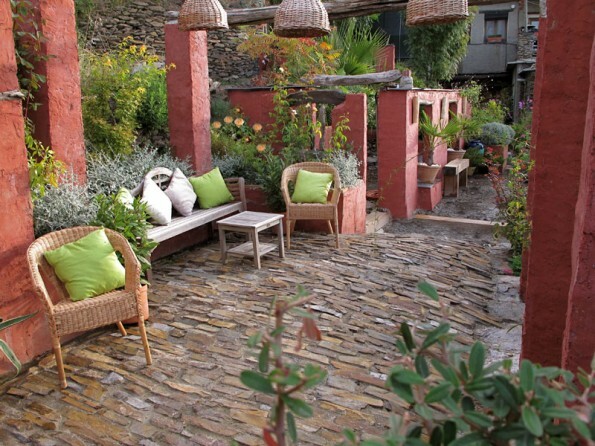 El Lujar has a private courtyard filled with flowering pots, and this leads to a part-covered patio which looks out across the garden towards the Rio Bermejo and to the village of Pitres (on a clear day you can see the Mediterranean). Tables, chairs and sun loungers are provided. There is a communal outbuilding with a washing machine. 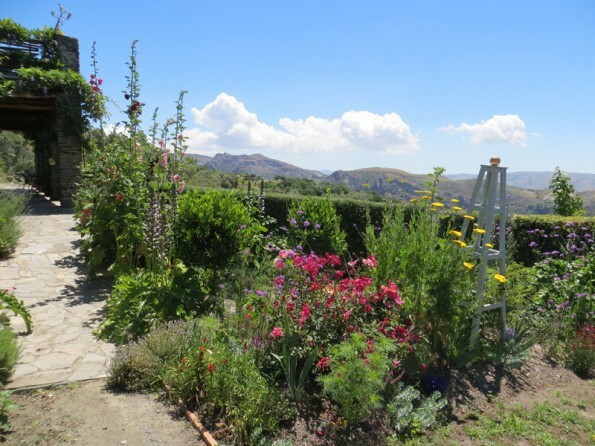 The garden at Cortijo Opazo is truly one of a kind. An enchanting and delightful oasis, it is stacked upon three sections of terraced land, made up of a number of distinctive areas. Find yourself amongst a loose prairie style garden, a pastiche of an English country garden, a wildlife and dry garden, and the formality of an Islamic style garden. 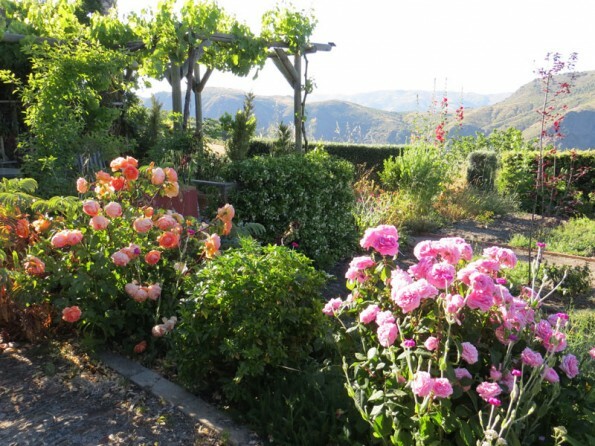 Here you will find flowers to gladden you and fruit and vegetables to nourish you. A great pleasure of a stay at Cortijo Opazo is a stroll around the garden, where you can find yourself a quiet spot to sit, read, reflect and enjoy some quiet contemplation. 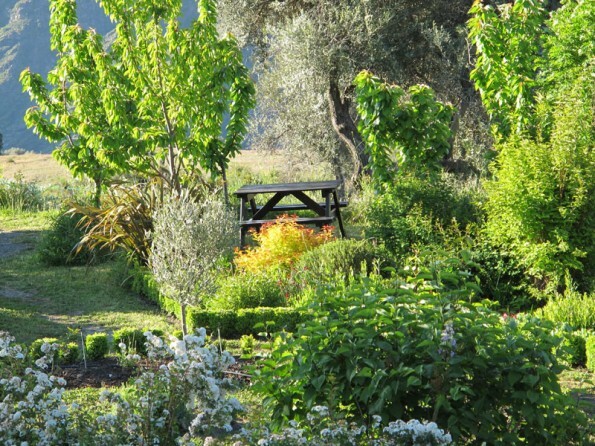 Once a week the garden is open to visitors, and during the summer there is an annual music concert. 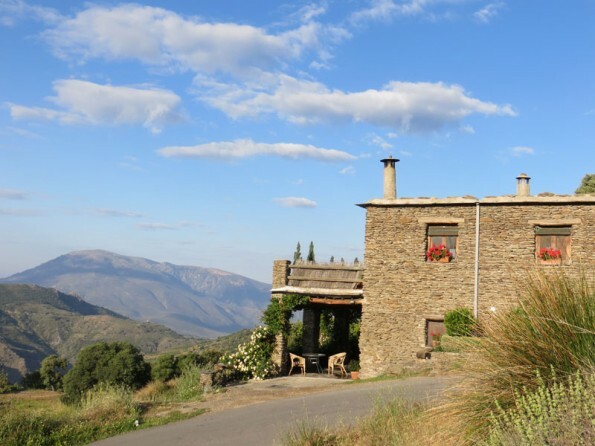 Further afield, The Alpujarras is an excellent location for walking, offering routes to suit all capabilities and expectations. 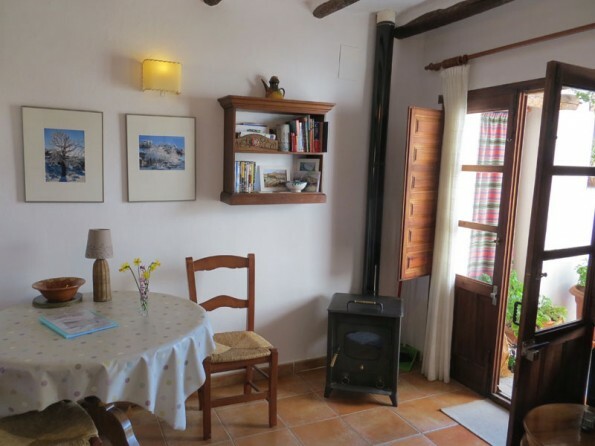 Cortijo Opazo can offer you fully catered tailor made walking holidays for groups of between two and six people, at any time of the year. Price includes all bed linen, towels, hot water and electricity. It also includes a supply of wood and a welcome pack of cooking essentials. Freshly cooked meals are available. A 40% deposit is required at the time of booking and the balance is due 8 weeks before the start of your holiday. Minimum stay is usually 3 nights. Pets can be admitted at an extra cost.